Copper metal roofing has been used for centuries already and it is preferred by many architects because of its stylish look and durability. Copper can match any architectural style: from classic English houses to modern buildings. However, some people are hesitant to use copper for their roofs because of its price. Truth be told, copper roofing is more expensive than other metal roofing materials. There are many homes that need roof repair in Allison Park, PA, But there is a light in this. Despite the high cost of a copper metal roof, one can actually save money in long-term. Why? Because copper is long lasting and it needs minimum maintenance unlike other roofing materials like asphalt shingles and wood. Companies like Gotcha Covered Contracting of Pittsburgh offer amazing metal roofing installation services. Nevertheless, a copper roof still needs some “preservation” to conserve its strength and beauty. Most copper metal roof users’ concern is whether it is appropriate to paint this type of roof. Actually, copper does not require any painting or furnishing. Such “beautifications” are usually applicable to other metal roofing systems. However, it is still in the preference of the architect to add a little color to the roof or not. You should be aware that in time, copper develops a natural greenish finish called patina – some people like its vintage look while others prefer modern, fresh-looking metal roofing colors. And don’t forget that there is always the option of applying a colorless protective coating to your copper roof – it will protect the roofing sheets from weather and deterioration without affecting their natural bronze color. 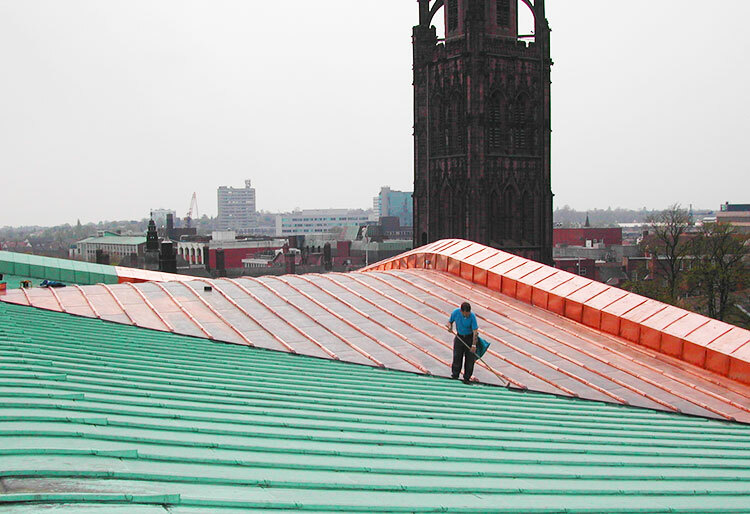 In painting copper roofing panels, the temperature and weather play an important part. They should not be painted when the temperature is very high and if a threat of rain is imminent. Once the place and temperature are secured, the next thing to do is to clean the roof thoroughly. Mud must be washed using a wire brush and the remaining dirt should be removed with sandpaper. It is also important to wash the roof with a pressure washer set on low. And then, using the blue painter’s tape, areas that do not require painting may now be covered. A primer should also be applied to the roof. This may be done using a paint roller. It is necessary that the priming starts in one far corner in a left-to-right movement. Using a paintbrush, gently smooth the primer evenly on the roof. These materials must be washed afterwards with warm water. Now, the painting may begin. First, make sure that you choose quality metal roofing paint which is suitable for copper. Take a cleaned and dried roller. Just like the movement in applying primer, painting copper roofing sheets must be done from left to right. Again using a paintbrush, smooth out the product until the entire roof is covered with paint. Usually, painted copper metal roofing takes about two hours to dry. One can also put on another coat if necessary. Several Internet sources teach a do-it-yourself tutorial on how to paint a copper metal roof. However, it is mandatory to ask for assistance from a professional in handling any maintenance procedures involving a metal roof. And before proceeding to such procedures, it must also be determined first if the copper metal roofing is suitable for any repainting. This is because some types of manufactured corrugated copper roofing are discouraged by their suppliers to be painted. They advise, instead, to just clean the roof every once a month and repair any sign of dilapidation and damage. Although copper metal roofs are durable and long lasting, they still need consistent care. They protect us from rain and sunlight; give us a safe, comfortable shelter. The best way we can show our gratitude to them is by providing them the care and attention that they need.